I've got a non-card project to share, something I created last night while my hubby was out at hockey practice and Lily was sleeping soundly. 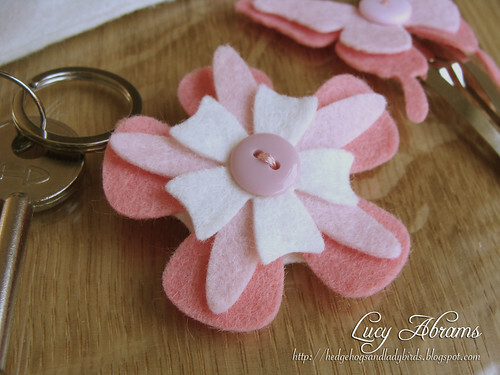 The felt, ribbon, buttons, ric rac, floss, key ring and hair clip were all in the kit - AND there's more left over for other projects. Here's a close up - the felt is really good quality wool felt. Yum. 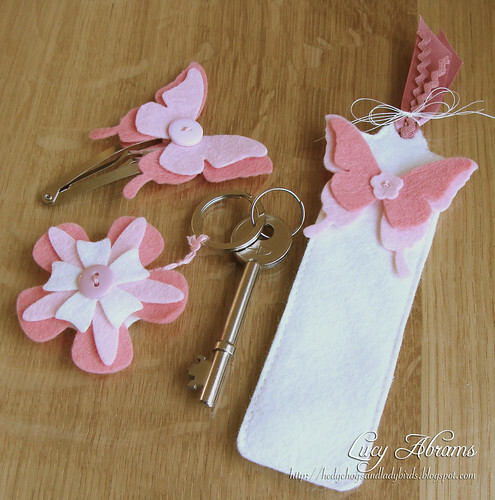 I think I might put these on cards... the key ring would be great on a New Home card don't you think? LOVE them, Lucy! What a great idea, those mini-makes! Uh, oh! I love these! Might just have to go take a look! Darling, little gift ideas, Lucy!